It’s Friday! We made it! I live for Fridays. Somehow, the time seems to stretch on a Friday afternoon and it feels like you can pack two days into one. Whenever possible, I try to wrap up my workday slightly earlier and run errands or take care of things around the house. Today I have a dentist appointment and I don’t even care because it’s Friday. Then we still have the whole evening ahead of us to do whatever we like. The. Best. You know what else is the best? These dark chocolate toffee almonds. I recently received a lovely package filled with Blue Diamond Growers goodies. A.K.A. almonds galore. Among the raw, roasted, salted, wasabi & soy sauce, and even blueberry flavored almonds (SO GOOD) was a package of butter toffee almonds. So of course I had to sass them up even more ASAP. 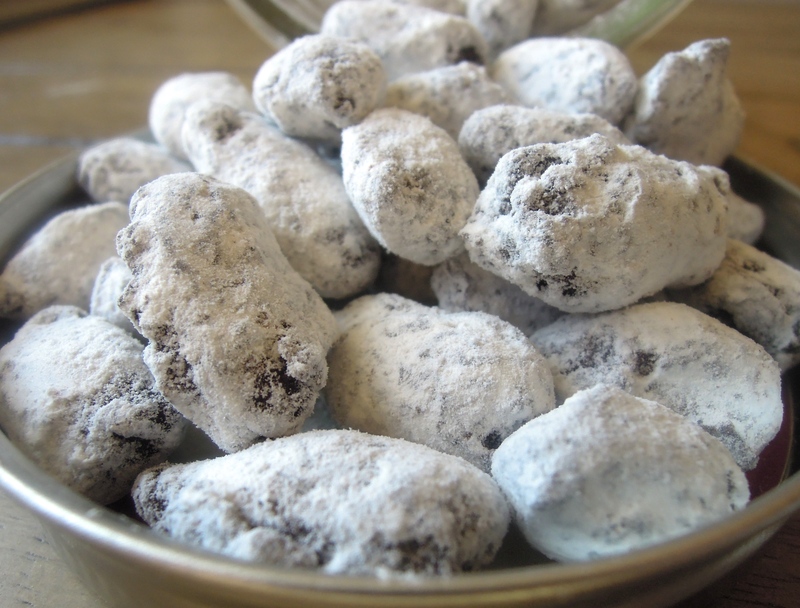 All you have to do is melt some dark chocolate, immerse the almonds in a warm chocolatey bath, and then roll them around in some powdered sugar. Wait for them to cool and enjoy every moment of the sweet salty buttery crunch. Of course since we’re combining almonds (hello, fiber and vitamin E) and dark chocolate (flavonoids!) this is practically a health food. Obviously. As a matter of fact, I think I’ll bring some to my dentist this afternoon. I’m sure he’ll totally get on board with that. Dump the chocolate chips into a microwave safe bowl. Microwave in 1 minute increments, stirring after each one, until melted. (About 2 to 2.5 minutes). In a separate bowl, add half the almonds. Pour enough chocolate on top to coat and use a spoon or spatula to coat all of the almonds completely. 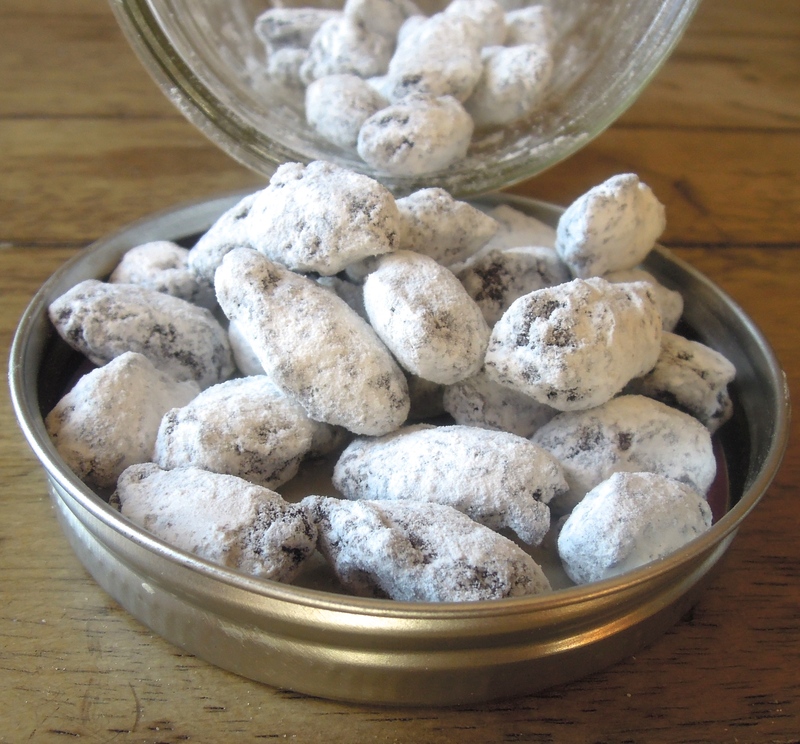 Pour in enough powdered sugar to coat, and mix until they’re covered. Using you hands, place each almond on a parchment-lined baking sheet. (It gets pretty messy.) Repeat with the remaining chocolate, almonds, and sugar. Place baking sheet in refrigerator or freezer for about 30 minutes until chocolate hardens. This entry was posted in Dessert on November 15, 2013 by Paige Greenfield.